Join artists curator Raghavendra Rao K.V., and members of the South Asian Canadian Histories Association to explore this artistic intervention in the story of Canada at 150+. Two works for the exhibition will be on view at the Asian Centre: Sameer Farooq’s Pouf, Sausage, Weight, Arc (2017), and How This Will End (2017) by Umesh M.S. Other artists taking part in the exhibition at UBC and in Punjabi Market include Vikky Alexander, Sonny Assu, Jason Baerg, and Hyung-Min Yoon. 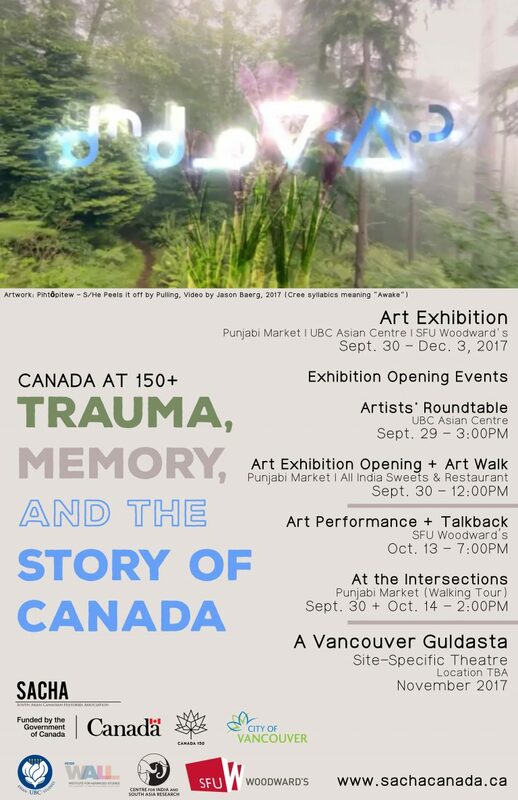 Join artists and members of the South Asian Canadian Histories Association for a public art display, performances, and art walk that explore the “Canada at 150+: Trauma, Memory and the Story of Canada” works in Punjabi Market. Free event.